An estimated 200,000 - 400,000 people in the United States contract Lyme disease each year, although only ~35,000 are reported (Johnson, et al.). Incidence has been increasing in both the United States and New Hampshire—and New Hampshire has the second highest incidence rate of Lyme disease in the country (CDC). JSI is working with a range of state and community partners throughout New Hampshire to identify, prioritize, and fund Lyme disease prevention awareness around the state. After completing formative research, JSI has convened stakeholders who are on the front line of tick encounter prevention, such as: state and local health departments, summer camps, childcare facilities, schools, and parks. 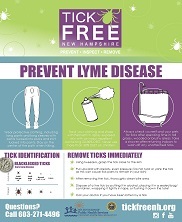 The grassroots education campaign leverages partnerships with state and local organizations, traditional and non-traditional partners, as well as the Tick Free NH Council, to educate and protect the New Hampshire public about Lyme disease prevention and avoiding a tick encounter. Learn about our social marketing campaign project about preventing Lyme disease in New Hampshire.